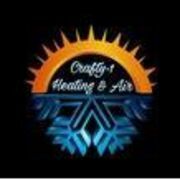 Crafty-1 Heating and Air LLC. A personal message from Crafty-1 Heating and Air LLC. Rate and review Crafty-1 Heating and Air LLC. in Fort Laramie, WY, United States! Share your experiences at Crafty-1 Heating and Air LLC. with your friends or discover more Heating and Air Conditioning in Fort Laramie, WY, United States.